In Episode 71, we interviewed Melissa Selem from Fertile Earth about composting. It’s been something we’ve thought about doing for awhile but hadn’t made much of an effort for several reasons: 1. Although we are homeowners, we don’t have any land to start a compost pile (although Melissa shared that you can create on multiple surfaces), 2. We are not fans of raccoons, possums and other things that go bump in the night and we felt that composting would attract them. 3. Our knowledge of composting was very basic and we felt that the science behind it seemed overwhelming. At the beginning of this year, we attended a workshop led by Fertile Earth at Smart Bites to Go showcasing their compost hub and explaining the steps of composting. It gave us a lot of insight into the intricacies of composting but we still didn’t feel confident enough to do it at home. 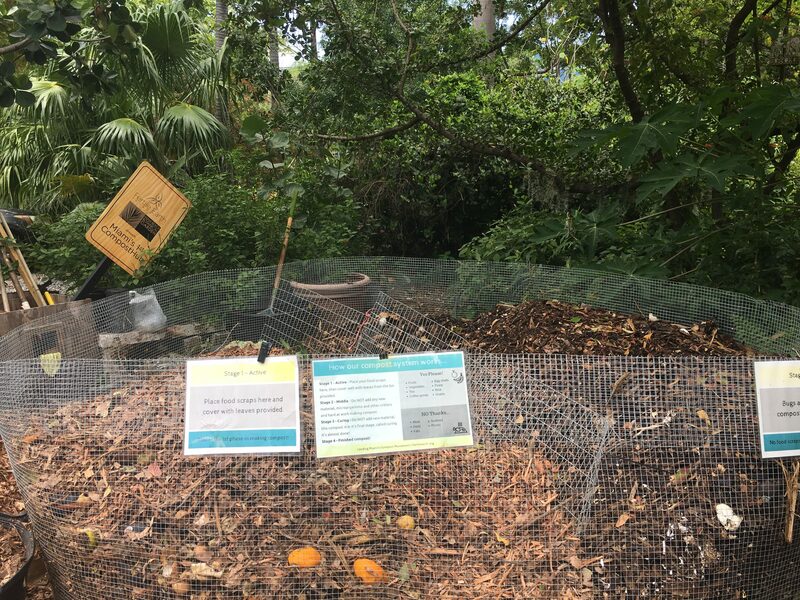 Since there are now two compost hubs in Miami: Miami Beach Botanical Garden and Smart Bites To Go, we decided to start saving our food scraps to eventually bring them to one of these locations. LESSON 1: We had way more food scraps then we anticipated. Since we didn’t have a bucket for storage, we decided to use a gallon size plastic bag. Before we knew it, we had four bags filled to the brim so we went searching for a better, more sustainable solution to store our scraps. We ended up buying a two gallon bucket with a lid from Lowe’s for just $6.60; no reason to get fancy. Although it’s not very big, it’s the biggest one we could fit in our freezer. Why would we keep it in our freezer? LESSON 2: A tip we learned from Melissa was to keep the food scraps in the freezer to avoid fruit flies and other bugs. This is exactly what we did and we had no issues. LESSON 3: It can be tricky getting into the habit of saving the scraps so to help, we keep a big bowl near us while prepping food to store them in one place and then transfer the scraps to a container. And don’t forget to take off the stickers because they don’t break down in the compost. LESSON 4: There are a ton of things that can be composted like fruits, veggies, coffee grounds and even dog hair (although we haven’t saved any of Abby’s hair). 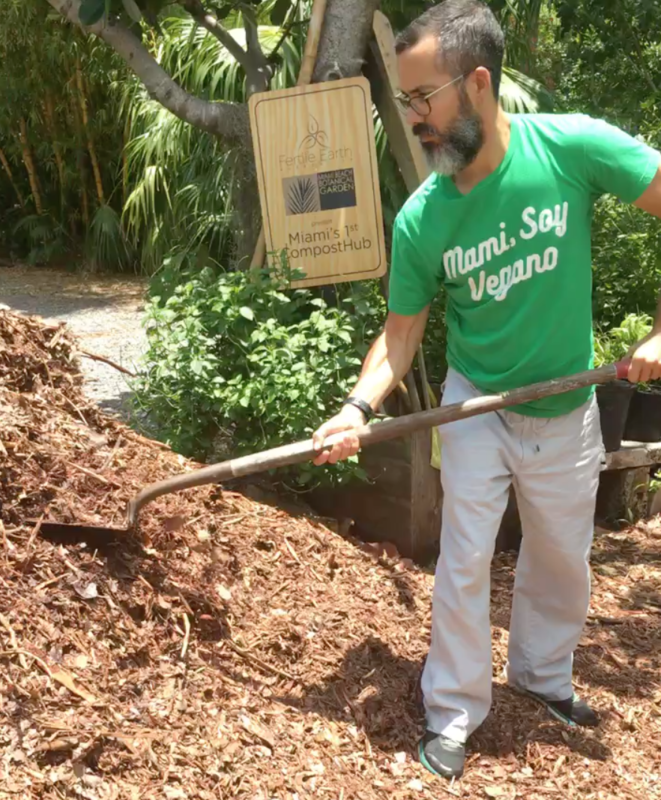 LESSON 5: We took our first compost trip to the Miami Beach Botanical Garden. The hub is really close to the parking area so it’s easily accessible. There are instructions guiding you to dispose of the scraps and then adding leaves to the pile to cover. Everything is provided for you including shovels and even compost that has been transformed into very fertile soil. We were in and out in less than 10 minutes. We understand that making composting a part of our life is going to take some time because it is an entirely new concept to not just throw food away. But the idea of our food becoming rich soil to grow more food and other plants is extremely encouraging. If you are currently composting, what lessons have you learned that you can share with us? Or if you have any questions, please let us know! Follow our composting journey on Instagram @plantedinmiami. To learn more about composting, listen to our interview with Melissa Selem from Fertile Earth here.